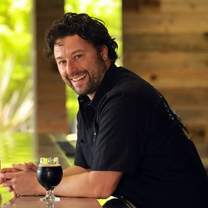 Tamburin had a previous career as a Dallas restaurateur and then later enrolled at UC Davis to get an undergraduate degree in enology and viticulture. He also took malting and brewing courses while in college. After working for Robert Mondavi Winery in Oakville, Tamburin wanted to concentrate on doing something entrepreneurial locally, which eventually led him to the opening of Old Possum Brewing. "Today’s the day! Gap in the Fog DIPA is on tap and we’re pumped to pour for you. Huell Melon and Amarillo hops will quench that parched gullet 😋🍻 Come thru today from noon to 10pm! #dipa"
"Our flagship beer is back on tap and is as refreshing as ever. The Fuzzy Critter is aptly named due to its stone fruit notes (peaches, nectarines, basically fruit with a fuzzy exterior). To top it all off its carbonation and Azacca + Mosaic hop balance make this a popular go to at Old Possum. ABV 7.1% #northbay"
"Back by popular demand, Mama’s Pouch Blonde is back on tap! Dry hopped with Citra with a 3.9% ABV makes this beer almost a lil’ too drinkable. So get away from the heat and come quench your parched gullet at Old Possum today 😎 #santarosa"
"🏀 ⚡️CURRY’S GOT HOPS⚡️🏀 Warrior & Pacific Jade Hops give this pale ale a spicy smooth balance to its grapefruit rind finish. Hey if you’re on a grapefruit diet, this counts as your daily grapefruit half. I think that’s how it works at least... ABV 5.1% #currydoesnthavehops . . . #craftbeerlife"
"Dry hopped Taiheke and Motueka (New Zealand hops) for a tropical fruit forward DIPA with aromas that give away the fact that your first citrusy sip is gonna give you flashbacks to that vacation in New Zealand you never actually took. *Cue the Lord of the Rings soundtrack**the camera pans to the Shire**Kiwi birds caw* #tropicalhops"